There are a lot of amazing things happening in my life right now. I forget that sometimes you just have to take a step back and be thankful for healthy family, friends and fabulous opportunities. Life is too short to not enjoy as much as you can and when you get the chance, run with it! One of the crazy things that I will be doing soon is a sprint triathlon! I haven’t shared this much on the blog but a friend said I should, since it’s such a huge milestone for me. So I think I’ll write up a short blog post tomorrow about my very animated training experiences. Look out for that! What’s also coming up is something I am SOO thrilled, thankful, blessed and going ga-ga for! Joe and I will be traveling to my great-grandparents home country of Istanbul, Turkey and then off to Barcelona Spain! My mom said her grandmother is from Istanbul and we have lineage that goes back to Spain as well! I can’t even express how excited I am! As huge foodies (yes…I like to use that word, even though some are weird about it?) Joe and I are planning to eat and cook our way through these gorgeous cities. Yes, I will be here…admiring the gorgeous Blue Mosque! 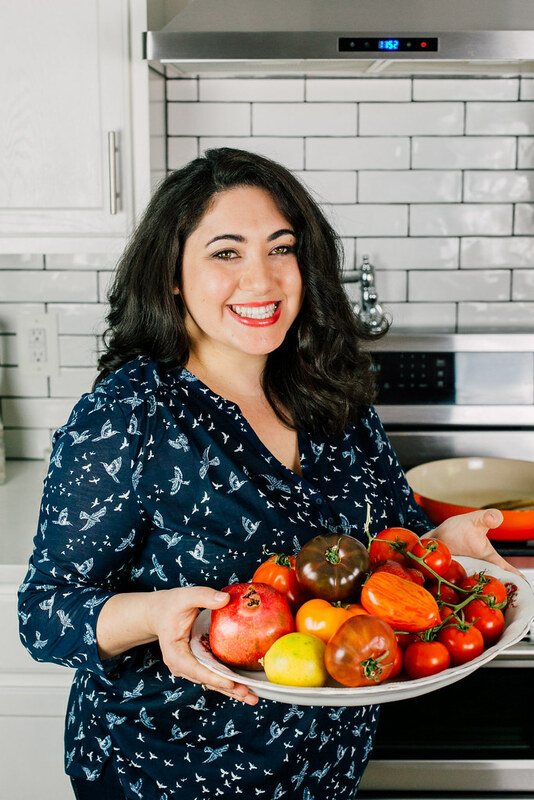 My blog has always been about cultural cuisine, as you know I often cook all sorts of dishes from different parts of the world, and now to be able to include Turkish and true Spanish (Catalan) cuisine to my repertoire is just truly mesmerizing! So it’s needless to say that the next few months will be crazy, exciting and deliciously filling! I can not wait to share everything I will learn with you! Now for today’s savory recipe…. I am a bit early for Hanukkah, since it doesn’t start until the end of November. But any chance to make latkes is a good time for me! I have all these ideas to make different flavored and topped latkes and this was the first one that caught my attention. 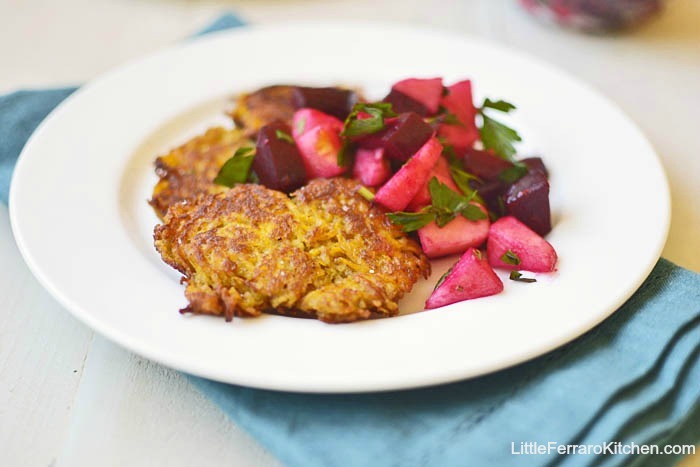 Butternut squash latkes are sweet and deep with a touch of cumin. I paired this fried treat with a chunky apple and beet salsa. 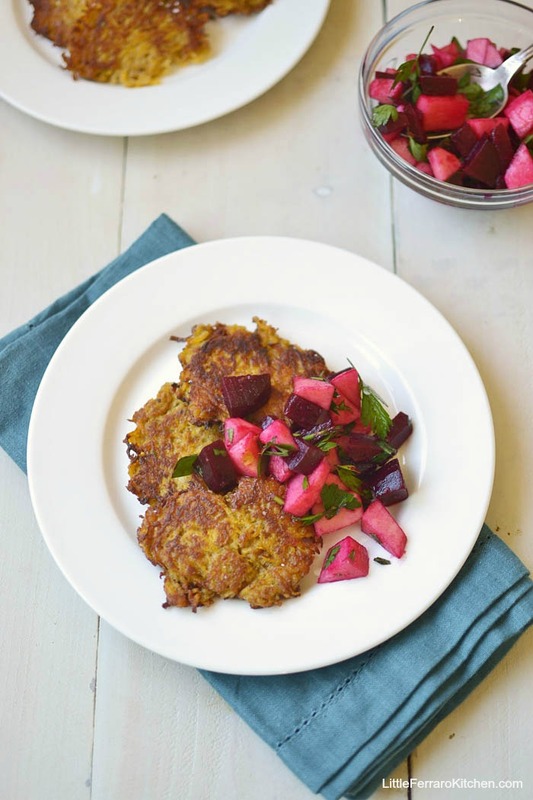 I was thinking about roasting the apples with the beets but though a fresh bite would pair nicely with the warm latkes. The absolutely MOST important tip when making latkes, any this goes for any ingredient you use for your latkes, is to squeeze as much liquid out of the shredded vegetable/fruit as possible. The more water that comes out of it, the crispier your latkes will be! And really, the possibilities are endless. So far I have parsnip, pumpkin, sweet potato, and apple latkes ideas running through my head. So have fun and get creative! Make the salsa first. In a bowl, add together all the ingredients and mix well. Taste for seasoning. Cover with plastic wrap and chill in the refrigerator until ready to use. Make the latkes mixture. Using a food processor with a shred attachment, shred the butternut squash. If you don't have one, a box grater with large wholes works great. Place a few handfuls of the shredded squash in a kitchen towel and use this to squeeze excess liquid from the squash. Do this with the rest of the squash and then place in a large bowl. To the large bowl, add the eggs, matzo meal and spices. Stir well. The mixture should not be too wet and should be able to hold together. If you think it's too wet, add a touch more matzo meal. Heat a large non-stick skillet over medium heat and pour about 1/4in oil in the pan. Allow the oil to heat up to about 375 degrees. Or you can test it with a small piece of squash mixture. It it quickly sizzles, it's ready. Use a large regular tablespoon to scoop up the mixture. Try and roughly form it into a circle and place it in the hot oiled pan. Allow to fry on first side for about 3-4 minutes and then flip over and fry other side for another 3 minutes. When done, place latkes on a paper toweled lined plate. Serve with the apple and beet salsa. Delicious! 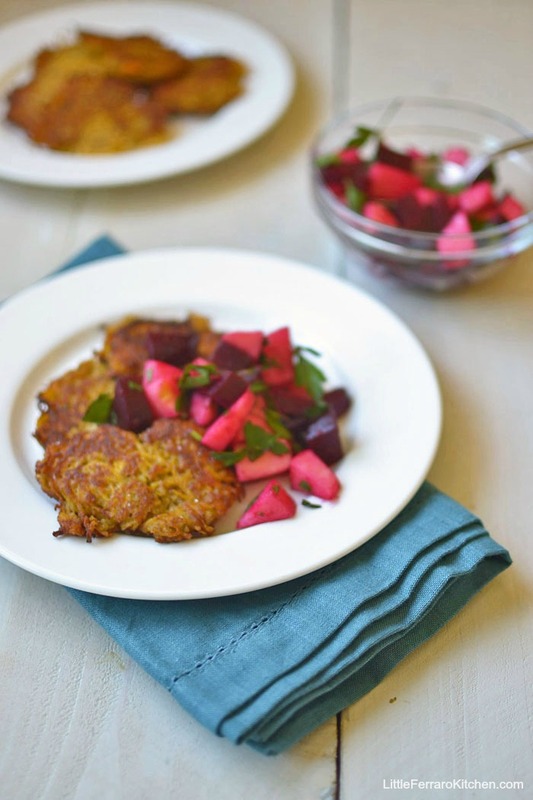 I love squash latkes. The sweetness with the potatoes is a fantastic pairing. Have a wonderful time in Turkey and Spain. I can’t wait to see all the pics from your trip. My family history also goes back to Spain but way way back (I’m talking Spanish Inquisition). We apparently have Portuguese heritage too but ran off to Holland. 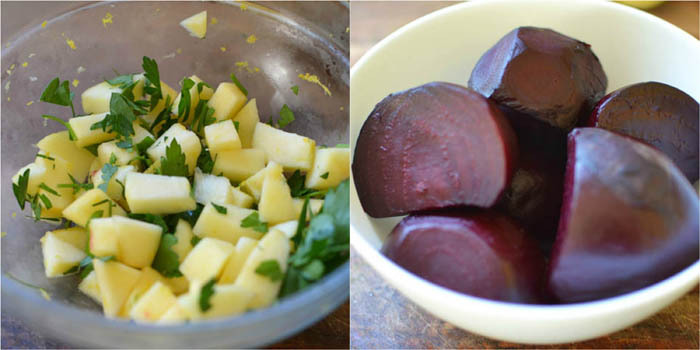 I seriously just want a big plate of the beet/apple salad. It looks amazing! Yay that trip sounds awesome! I always try to remind myself how awesome my life is that I can do what I love and just enjoy the moment! Good luck on the triathlon- that’s so awesome! I lived in Barcelona in college- 10 years ago actually. Gag! But I can give you some tips. Oh and delicious looking latkes too! Yesss email me recs!! We’re also going to San Sebastian! !